Spectacular Lake & Mountain views from this impeccably maintained Custom Contemporary home on Lake Champlain. Not a detail has been overlooked in this sprawling 3 bedroom, 5 bath home. 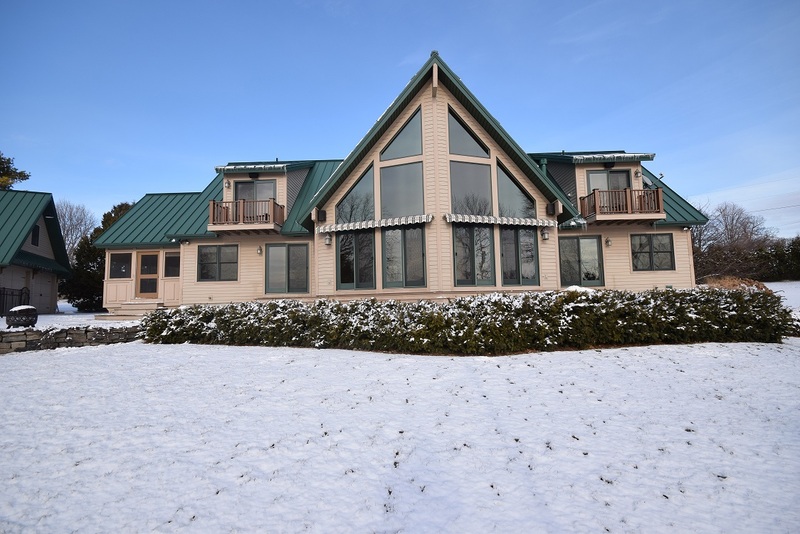 Beautiful open floor plan boasts great room with 22 ft cathedral ceilings, floor to ceiling windows with endless views of Lake Champlain and the Adirondack Mountains, and a stunning gas fireplace. Chef’s kitchen offers top of the line appliances, custom cabinets, granite counter tops, and a great center island. Custom Southern Yellow Pine woodwork throughout. First floor master suite with huge walk-in closet and private bath with tiled shower, whirlpool tub and dual sinks. Private patio access off master suite makes for the perfect spot to relax and watch the sunset! Two spacious suite style bedrooms sit on upper level, both complete with TV, refrigerator, ¾ bath and balcony. This home was made to entertain, equipped with sound proof Home theater with chairs, surround sound and projector screen. Southern Yellow Pine Bar with double fridge, wine cooler, ice maker sink, and more! Cedar closet located in basement too! Enjoy entertaining family and friends on sun porch or swim in the heated pool while enjoying the lake views! Other incredible features include central vac, multi-zone heat, radiant heat floors, security system, whole house back-up propane genarator and much more! This lovely home is eagerly awaiting it’s new owners, so hurry and see for yourself all this beautiful home has to offer!